Around 50 miles away from the touristic hotels and Disney theme parks of Orlando sits the city of Daytona Beach. Located in Volusia County on the Atlantic Coast of the Sunshine State, Daytona Beach is the main city in the 'Fun Coast' region and the Deltona-Daytona Beach-Ormond Beach metro area. Daytona Beach is home to around 68,000 people and well known for its motorsports culture and history, being the site of the old Daytona Beach Road Course, which hosted many races over the course of more than five decades. Nowadays, the primary racing track in Daytona Beach is the Daytona International Speedway. With its strong racing-based culture, Daytona Beach is also the HQ of NASCAR and hosts lots of events all through the year, with the Speedweeks of January and February being especially popular and attracting hundreds of thousands of people to the city. If you're heading down to Daytona Beach for a NASCAR race or just to spend some time on the beach and checking out the local attractions, there are plenty of popular RV parks and campgrounds just waiting to welcome you in. Read on to learn all about the best RV parks in Daytona Beach. Situated down in the southern part of the city, Daytona RV Park & Tropical Gardens easily distinguishes itself from other Daytona Beach RV parks through its stunningly beautiful gardens and landscaped grounds. Daytona Beach is typically associated with the metal of race cars and the concrete and asphalt of the track, but this RV park lets you see and enjoy a more natural side of the city, with lots of pretty palm trees and tropical plants dotted all around the park. It can be a lot of fun to simply walk around this RV park at any time of day and admire the stunning of flora on show, with the park's setting and scenery lending itself well to romantic getaways. Daytona RV Park & Tropical Gardens is also in a great location for exploration of Daytona Beach, being only 5-10 minutes away from some excellent beaches, restaurants, bars, race events, and more. There's a very friendly atmosphere at this Daytona Beach RV park and the park is fitted out with plenty of affordable full hook-up sites on 12 acres of land. On-site amenities here include a swimming pool with its own tiki bar, a beautiful fishing pond, clean toilets, hot showers, storage facilities, lots of palm trees and other trees providing plenty of shady spots, a community room to hang out with other travelers, laundry machines, and even vending machines so you never have to go too far for a snack or drink. Statistics show that the vast majority of people who head down to Daytona Beach are visiting the area to attend one of the many races and race events the city hosts all through the year. Whether you're in the area for a Speedweek event or another NASCAR race, the Daytona Speedway RV is one of the best options for you to choose due to its prime location on International Speedway Boulevard. It's one of the closest parks to the speedway itself, while also providing a feeling of comfort and seclusion that you might not expect from such an inner city location. Daytona Speedway RV essentially offers the best of both worlds; easy access to the local attractions like the Speedway, and a lot of peace and quiet in the evenings too. This Daytona Beach RV park features full hook-up sites with 30/50 amp service and up to 80 feet of room, so it can handle big rigs with ease. 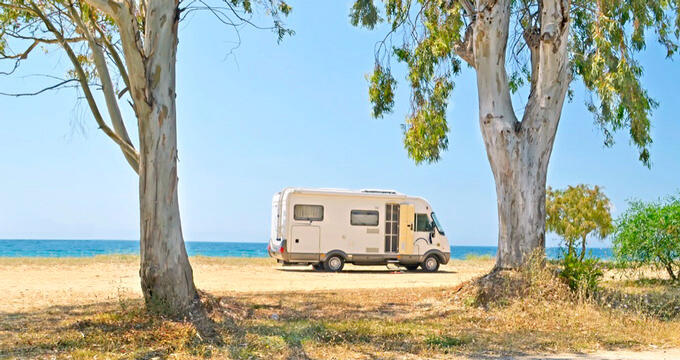 All RV users will also be able to access wireless internet and cable TV channels too, as well as having access to the on-site amenities like firewood and propane sales, restrooms, and a huge camp store selling all sorts of souvenirs, supplies, and more. The staff at this location are really friendly too and are always around to help out with any problems you might encounter or to simply provide directions or advice to help you make the most of your time at Daytona Beach. Located in a key area in the center of the city, offering very quick and easy access to the Speedway, Daytona Racetrack RV is one of the new kids on the block in the RV scene of Daytona Beach but has swiftly established itself as a big name player, providing super standards of service and some great amenities to ensure that every guest has a great experience. In fact, many people who have stayed at this Daytona Beach RV park have gone back again for repeat visits, and as soon as you roll through the gates, you'll start to understand just why this RV park is so highly rated. Daytona Racetrack RV is the leading special event campground and RV park in Daytona Beach, perfect for big groups and gatherings and offering super easy access to the Speedway and local restaurants too. This park opens up for various special events throughout the year like the Daytona 500 and the Coke Zero 400, offering very spacious sites that can measure up to a total of 100 feet in length. All sites offer 30/50 amp power, and the park features round-the-clock on-site management, so there's always someone around to help you check-in and set-up your RV. The park also benefits from 24-hour security patrols too, providing much-needed peace of mind to help you feel totally at ease during your stay.